A handful of season high scores were set this weekend while one Big Ten team has started an upset streak after a second-straight surprise performance. With those season highs and a switch in the rankings system for next week, check out this week’s results to see who will be moving up and down in the standings. The sophomore stuck nearly every landing of his impressively difficult floor routine to match the nation’s highest score on any apparatus thus far this season. The Hawkeyes were even more outmatched this weekend against third ranked Michigan on the road, but it didn’t prevent them from winning against a higher ranked opponent for the second weekend. Iowa’s consistency across all six events proved to be the difference as it was just able to edge the Wolverines. 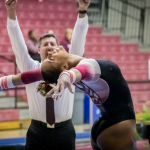 The Big Storyline: Despite posting a season high and winning two event titles, Illinois was unable to come out victorious and fell to Oklahoma as the Sooners posted a new season and NCAA high score on senior night. One of those seniors, Yul Moldauer, won three event titles and posted the nation’s second highest all around total of the year, even with a fall on high bar. Sooner senior Levi Anderson was the other Oklahoma event winner of the night with his high bar victory. The meet was close through the first three rotations thanks to the Illini’s two event winners—Michael Paradise on pommel horse and Alex Diab on rings. Implications: Illinois will move up to fourth in next week’s rankings while Oklahoma will actually slide down to second due to a change in the rankings format that emphasizes road scores. Records: Oklahoma bested the NCAA leading rings total this season with a 71.750. The Big Storyline: After an upset road loss last weekend, Stanford returned home to take care of business and defeat visiting Air Force by a hefty margin. The Cardinal also swept all six event titles while senior Grant Breckenridge grabbed his second all around title of the season. The Falcons’ best result came on high bar where senior Lukas Texeira placed second only half a tenth behind winner David Jessen. Implications: Air Force will remain ranked 13th next week while Stanford will regain the top ranking in the country. Records: Blake Sun won parallel bars with a career high score that is also the second highest mark on the event in the NCAA this season. The Big Storyline: Iowa used a season high to offset Michigan’s all around and five event title wins to take down the Wolverines on the road and earn its second upset win in as many weeks. Michigan won four events, but Iowa’s margin of victory on pommel horse and parallel bars won the Hawkeyes their second Big Ten matchup. Sophomore Bennet Huang was they key for Iowa, notching career highs in the all around (82.400) and on floor (14.900) while grabbing the Hawkeyes’ only event title on vault. Implications: Iowa’s score will jump them to No. 8 in next week’s rankings while Michigan will remain third. Records: Jacob Moore’s 15.300 on floor broke the Michigan record for highest score on the event. The Big Storyline: Penn State avenged an upset loss from last weekend by heading down to Arizona and defeating four non-conference foes. The Nittany Lions also claimed five event titles, led by star Sam Zakutney’s parallel bars and high bar wins. Navy placed second behind the strength of Lucas Beltran, who placed second on floor and was the only non-Penn State gymnast to win an event with his title on vault. Freshman Jordan Williams won the all around for Arizona State and Air Force’s Lukas Texeira placed second on high bar for the second time this weekend. Implications: In next week’s rankings, Penn State will slide to fifth and Arizona State to 15th while Navy stays the same and NorCal United rises to 20th. Records: NorCal United’s 282.000 is the second highest score in program history. The Big Storyline: Shane Wiskus won two events on his way to taking the all around title, helping lead Minnesota to a Big Ten tri-meet win over Nebraska and Ohio State. Each school had one gymnast win two event titles, with Anton Stephenson winning floor and vault for the Huskers and Alec Yoder taking the pommel horse and parallel bars titles. 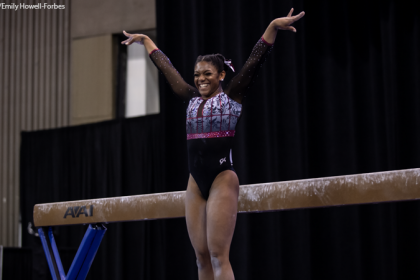 The Gophers were able to overcome a pommel horse rotation with two scores under 12 by winning three events to ultimately edge the Buckeyes. Nebraska won vault and high bar to take two events while Ohio State won pommel horse. Implications: Minnesota will remain sixth in the next edition of the rankings while Nebraska moves up to seventh and Ohio State slips to ninth. Records: Wiskus’ winning scores on rings and high bar are also career highs for the sophomore. The Big Storyline: It was the Aaron Mah show for California on Sunday as he led the Golden Bears to a new season high and victory over host Washington. Mah won four event titles on the night while freshman Darren Wong grabbed a fifth for California while also winning the all around. 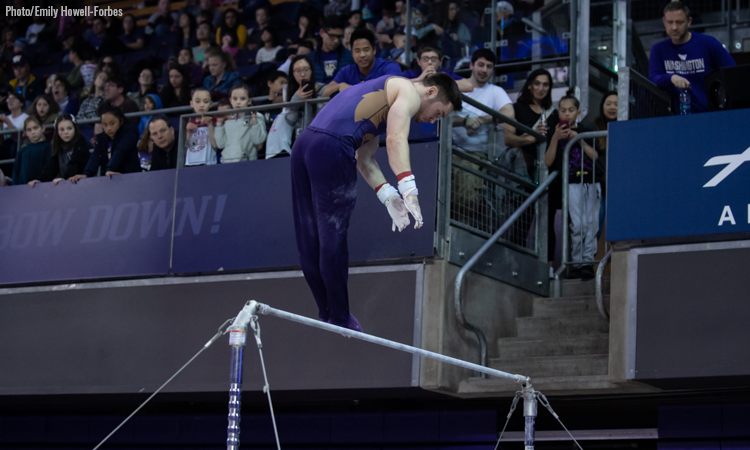 Washington also had a stellar meet, beating its previous season high by 16.5 points and grabbing two event titles thanks to Jacob Jarrett’s win on vault and Nathan Tsuji’s share of the floor title. Implications: Despite the strong showings by both teams, California will remain ranked 11th and Washington 17th. 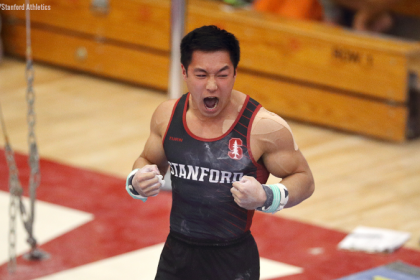 Records: Wong’s all around total marks a new career high while Mah set new season bests on floor, rings and high bar. The Big Storyline: Matt Davis continued his stellar freshman campaign for Army by placing in the top three on every event and helping lead the Black Knights to a home win over Springfield. Army won five events and five event titles on the night while Davis took the all around crown. Springfield struggled in the first three rotations before finishing the meet strong. The Pride won parallel bars, led by senior Jannik Haas who won the event title. Implications: Both teams will remain ranked the same next week. Records: Graham Shaw and Rex Scott set new career highs en route to their event title wins for Army. The Big Storyline: Despite posting its second lowest score of the season, William & Mary was easily able to defeat UIC on the road in Chicago. The Tribe won five events and five event titles, only missing out on pommel horse for both as UIC grabbed the win there largely in part to Colin Schwartz’s winning set. Cutter Fugett and David Watkins led the way for William & Mary by winning on their specialty events while UIC’s Sam Montague nabbed the all around title. Implications: Neither team’s ranking will change in next week’s standings. Records: Schwartz’s winning pommel horse routine set a career high for the UIC sophomore.